MALLET, A.M. - Des Colures. Des Colures. - MALLET, A.M.
Map maker : MALLET, A.M.. Size : 5.8 x 4.2 inches. / 14.8 x 10.6 cm. 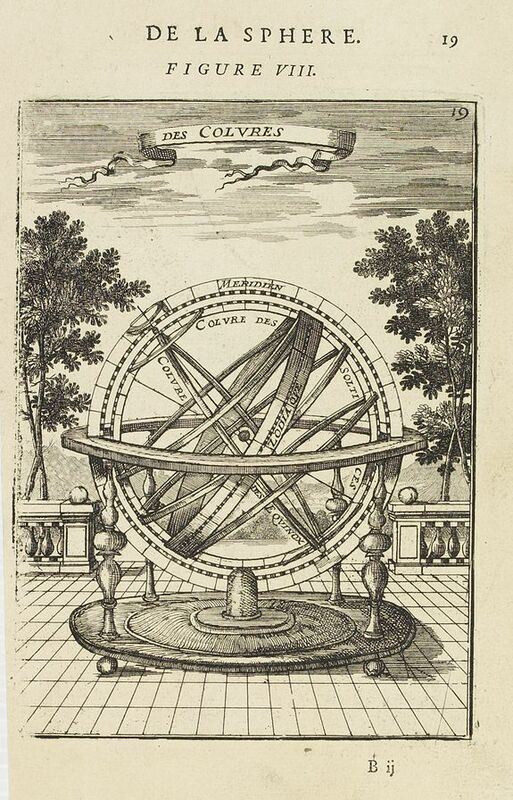 Description :Appealing print focused on an armillary sphere showing the equinoctial and the solstitial colures. From the French text edition of Description d''Univers.. (5 volumes), 1683. By Allain Manneson Mallet (1630-1706), a well travelled military engineer and geographer who worked in 17th century France under King Louis XIV. Condition : Some age-toning of paper. Stain in the lower left corner, not affecting the engraved area. Left margin cut short. Else good condition.